There are a lot of great things about summer. Warm weather, summer vacations, and one of my favorites: local produce. Feeding your family locally sourced food has quite a few advantages. For example, it's much fresher because it didn't have to travel across the country to get here. That lack of travel means the carbon footprint of your food is a lot lower. When cook with local food you're keeping your money in your local economy. If you grew the food yourself, that's even better; it doesn't get any fresher and there's a lot of pride that goes into cooking homegrown food. This week I decided to create a new veggie patty all from local items. I had an idea in mind and although I'm kind of a make it up as you go along kind of girl, there was a method to my madness. They turned out quite tasty and they're healthy too. Would you like to make some? Pull up a chair for the recipe and instructions. You'll also need a medium bowl, a food processor, and a cookie sheet lined with parchment paper. First, set your oven to 375 F to preheat. Next, start multitasking! I picked about 1.5 cups of basil off the stems and washed it, then dried with my salad spinner. While this was happening, my pine nuts were toasting in the toaster oven. I used the "medium" setting...just make sure to keep an eye on them so they don't get too dark for your taste. Make sure your food processor has the chopping blade on it for now. Put the basil, pine nuts, onion (quartered) and garlic in the processor. I used 4 cloves. I'm trying to keep vampires away. If you prefer less garlic, feel free to adjust to how you like it. Turn the food processor on for about 5-10 seconds...we want to chop this stuff but not turn it into paste! Put your chopped mixture into your bowl. It will look a little bit like tabouleh. Rinse and dry your food processor, then put the grating/shredding blade on it. Turn it on and feed manageable pieces of zucchini into the processor until it's all chopped. Once chopped, put the zucchini onto a plate with paper towels or cloths and put another towel/cloth on top. Press down and get as much as the moisture out of the zucchini as you can. This part is really important! Once you're done loving and squeezing the zucchini, dump it into the bowl with your other ingredients. Add one egg use your hands to mix. 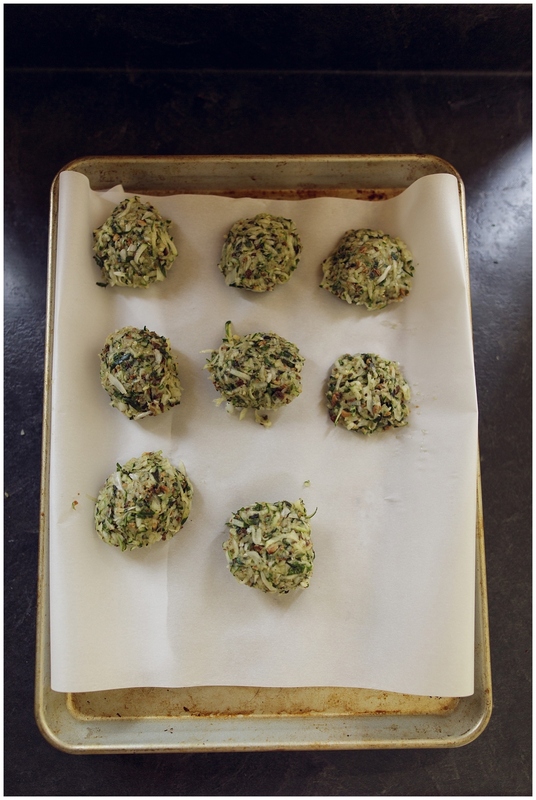 Form into burger-sized patties and put each patty on your parchment-lined pan. Bake until the tops begin to brown, but are not burned...nobody likes a burned veggie patty! For me, this took approximately 15 minutes. I had my oven on the convection setting which usually speeds things up some so figure on anywhere from 15-25 minutes. When your patties are done, let them cool a bit then enjoy! We ate them with other fruits and veggies and without a bun, though these could also be put on a bun for a more traditional burger experience. Good thing we have leftovers...I'm hungry! Enter your email to get my five tips to taking better photos of your family!